> Home / Useful / Properties / Go Green! Spring is the perfect time to move, make changes in your home or simply renovate. 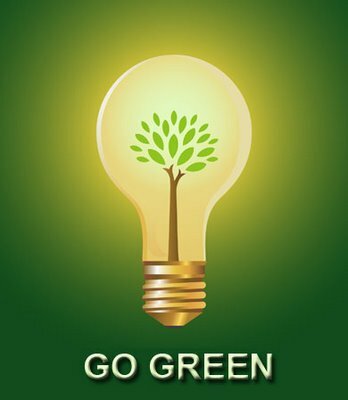 It is also the best time to go green! This trend has spread vigorously in the business sector, with a growing number of office buildings adopting ecological solutions, however it’s also affecting many private owners. Energy efficient windows, doors and skylights can reduce energy bills and cut tax burdens, which are the main incentives for homeowners to invest into new technologies and appliances. Windows, doorsand skylights must be‘Energy Star’ qualified. Replacing old with new ones lowers household energy bills by 7-15 percent. Lower energy consumption also reduces greenhouse gas emissions from power plants and shrinks a house's carbon footprint. Adding insulation can be one of the biggest cutsin your home budget. Typical bulk insulation products are such as batts, rolls, blow-in fibers, rigid boards, expanding spray, and pour-in-place. Heating, Ventilation, and Air Conditioning (HVAC) can be upgraded to use no more than 2 percent of the home’s total energy.Whether you choose natural ventilation, waste wood heat, a swamp cooler, a high efficiency condensing furnace, a ground source geothermal heat pump, or an efficient ceiling fan, your Green HVAC choices will make a difference in your comfort, your wallet, and the health of our environment. Air source heat pumps offer an energy-efficient alternative to furnaces and air conditioners in moderate climates. Like your refrigerator, heat pumps use electricity to move heat from a cool space into a warm, making the cool space cooler and the warm space warmer. During the heating season, heat pumps move heat from the cool outdoors into your warm house; during the cooling season, heat pumps move heat from your cool house into the warm outdoors. Because they move heat rather than generate heat, heat pumps can provide up to 4 times the amount of energy they consume. Biomass Stovesburn biomass fuel, such as agricultural crops and trees, wood and wood waste and residues, plants, grasses, residues, and fibers. They have a thermal efficiency rating of at least 75%. Water heating can account for 14%–25% of the energy consumed in your home. Go tankless and save a lot. If you are building a new home, you can also implement larger scale projects for small wind turbines andsolar and geothermal energy systems. One of the best ways to lower utility bills is using solar energy.Most users frequently see a return on investment of over 20% for a purchased solar system, orlower monthly bills on a power plan purchase.